Well lately I have written a lot of code for file manipulation, I/O etc. 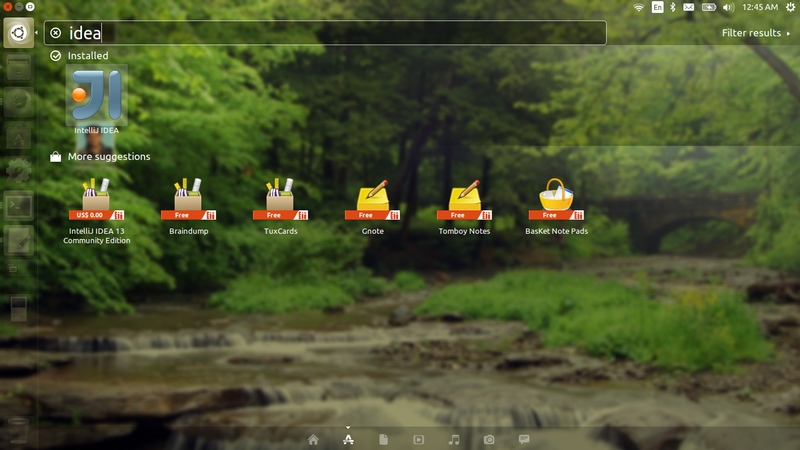 So let me take this post to show how can we create or delete directories. 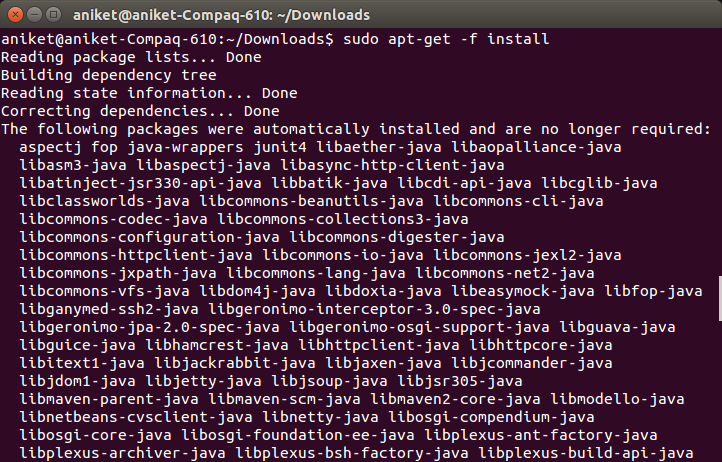 Well Java provides APIs for them so it should be pretty straightforward to understand. Important point to look forward is that if you are deleting a directory and it has more files in it then the directory will not get deleted unless all it's children are deleted recursively. Note File as a Java object can represent either a file or a directory. You can use File 's class isDirectory() method Eg. 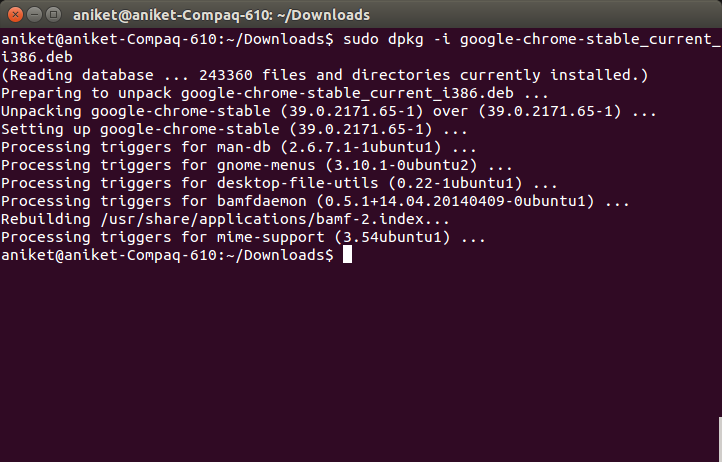 Now lets get to creating and deleting directories/files. 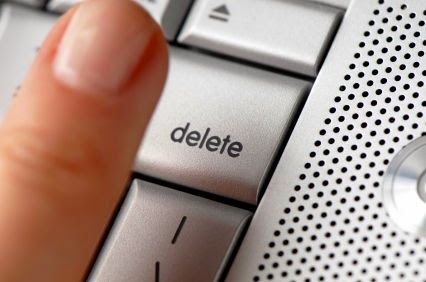 To delete a file or a directory we have to use delete() method. As stated in introductory paragraph if directory has data that data needs to be deleted first. "rm -rf *" does not work in java :). Above method will delete complete directory. 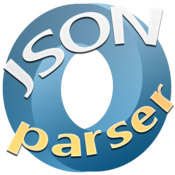 Creating a simple JSON parser for parsing various similar response types. 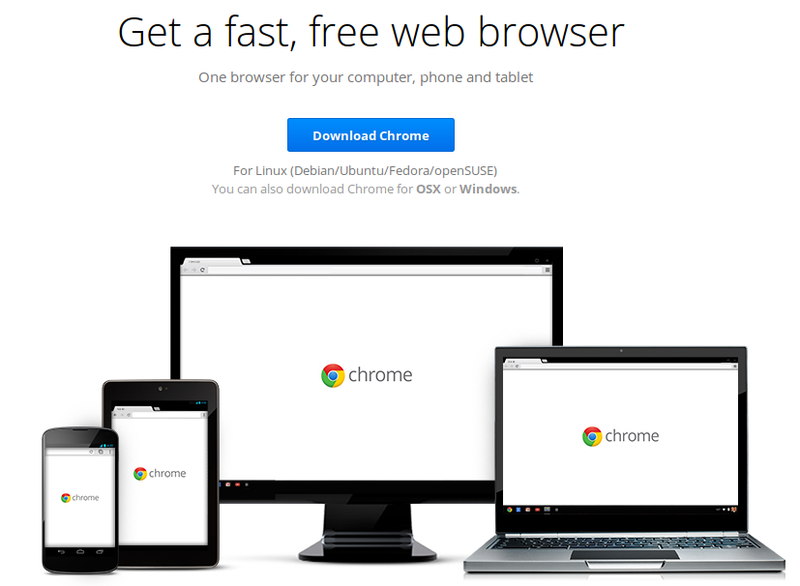 Many a times it so happens that a particular service or APIs return a set of similar resources. 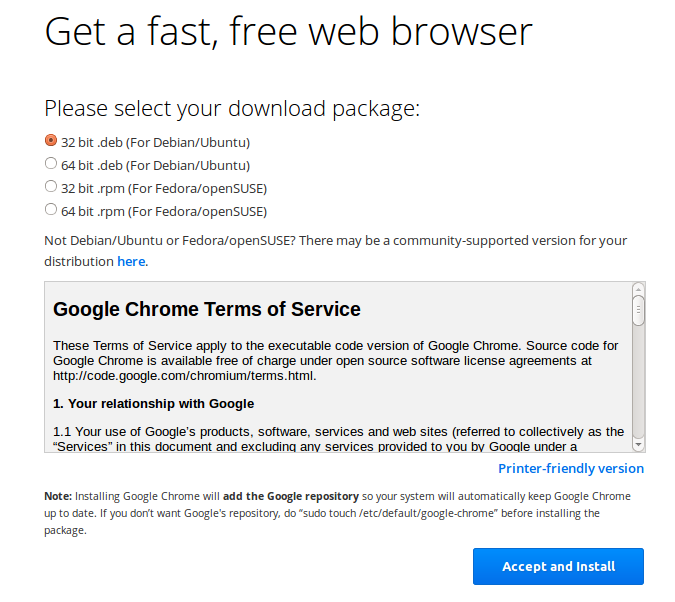 So how do we handle it in a client that uses these APIs or services. One way is that you check the incoming response against all the exhaustive possible list of responses . One would match and you will have your result. But that's very bad programming. So many if-else statements. Plus so much computing time wastage. Surely not a way to go for production code. In this post I will show how can write a simple parser that parses such requests. Before we go to the code let me explain the problem which we are going to solve with the parser. Assume there is a Service or an API that returns an Animal. For example you want a pet you may ask for Dog or a Cat. If you want to participate in horse racing you may ask for a Horse or a Hen for poultry etc. Point is we have to build a client that can parse the incoming requests. So if someone asks for a Dog we should parse the response for a Dog and prove it is indeed a Dog. For simplicity of code and understanding I am just going to work with Class Dog and Class Cat. To differentiate between them I am adding bark() method in Dog class and drink() method in Cat class. Also we have a super class called Animal. Both Dog and Cat class extend Animal Class. We will leverage the concept of polymorphism. It may have additional attributes depending on the type of animal. For Cat and Dog I have added another attribute called isPet. What will be more important is the type which is common to all the responses. We first create a map of type(exhaustive list of possible types of Animals) and their model classes. All type of Animals extend Class Animal which has the type that will be common to all the JSON responses. So we first convert the json string into Animal object which in turn provides us the information about what type of Animal it is. Then we use this information to get the model class used to describe that type of Animal and again parse the json String to covert it into that specific type of Animal and finally return it. Yes we have used polymorphism here to make our task easier! Note these are not mutually exclusive (We will come to that in a while). But given a relationship between a Class or it's object their interactions can be described with above categories. Also to represent these relationships there are UML diagrams (Wiki) . For example we may have Class diagram or Use case diagram or a timeline diagram. Above classifications are also used in these UML diagrams. 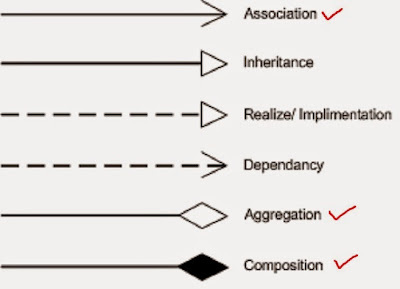 When we think of Object oriented nature we always think of Objects, class (objects blueprints) and the relationship between them. Objects are related and interact with each other via methods. In other words object of one class may use services/methods provided by object of another class. This kind of relationship is termed as association. For example you are related to your parent. In other words you are associated with your parent. This type of generic relationship is called association. 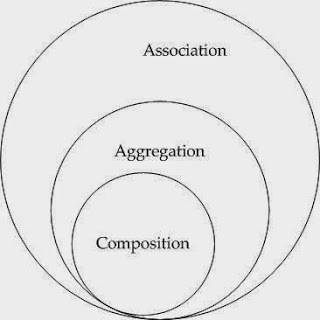 Aggregation and Composition are subsets of association meaning they are specific cases of association. 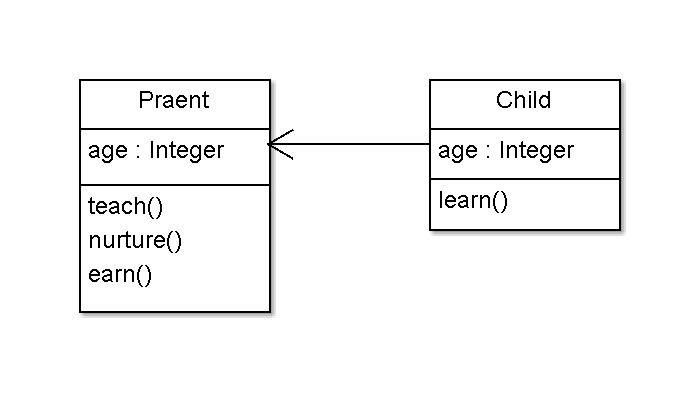 In both aggregation and composition object of one class "owns" object of another class. But there is a subtle difference. In Composition the object of class that is owned by the object of it's owning class cannot live on it's own(Also called "death relationship"). It will always live as a part of it's owning object where as in Aggregation the dependent object is standalone and can exist even if the object of owning class is dead. So in composition if owning object is garbage collected the owned object will also be which is not the case in aggregation. Composition Example :Consider example of a Heart and an Human. This type of relation ship between Human and Heart class is called Composition. Object of Heart class cannot exist without object of Human class and object of Heart has no significance without Human class. To put in simple words Humanclass solely "owns" the Heart class. 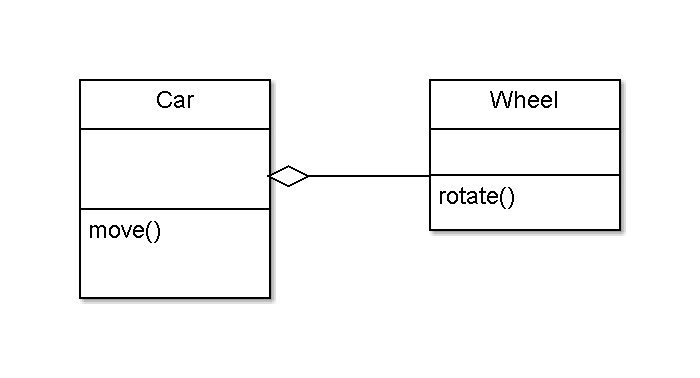 Aggregation Example :Now consider class Car and class Wheel. Car needs a Wheel object to function. Meaning Car object own Wheel object but we cannot say Wheel object has no significance without Car Object. It can very well be used in a Bike, Truck or different Cars Object. To sum it up association is a very generic term used to represent when on class used the functionalities provided by another class. We say it's composition if one parent class object owns another child class object and that child class object cannot meaningfully exist without the parent class object. If it can then it is called Aggregation. it lets you choose your strategy from a list of predefined ones depending on what would suit your current runtime context. 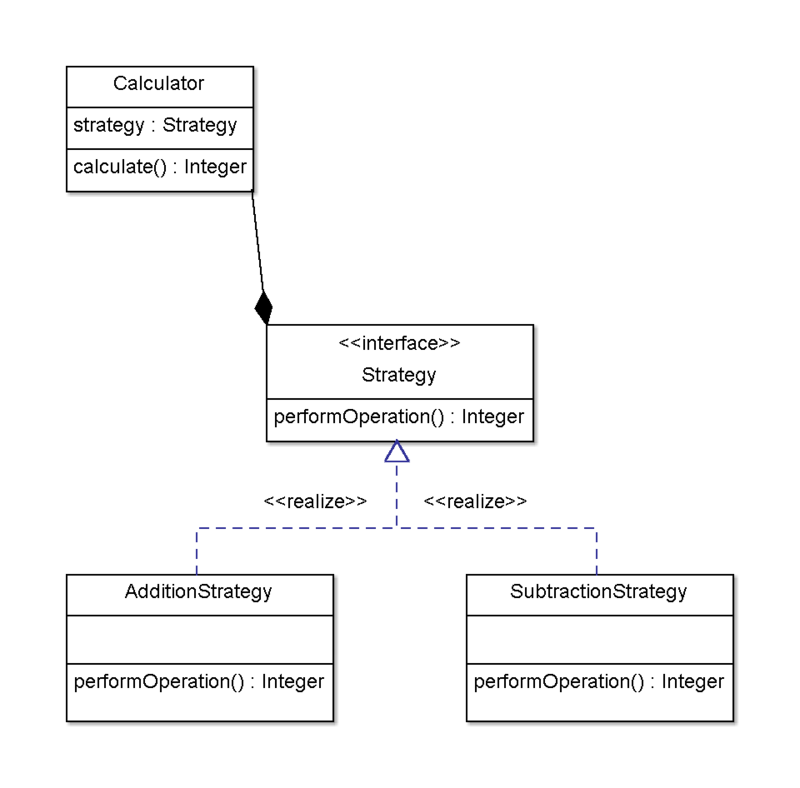 Both concrete type of Strategies i.e AdditionStrategy and SubtractionStrategy implement the interface Strategy that has a common method performOperation() that each implementing class implement. Also note the composition relationship between Strategy class and Calculator class. It simply means Calculator class owns Strategy class and that Strategy class cannot exist meaningfully without Calculator class. See how we could change the operation using a particular strategy depending on the requirement. Calculator here is own context. When we needed addition we use the Addition Strategy and when we needed Subtraction we used the Subtraction strategy. Note how the context or the Calculator remains the same but the strategy used changes. We are simply using different strategies depending on the requirement at runtime. This type of design is called Strategy pattern. 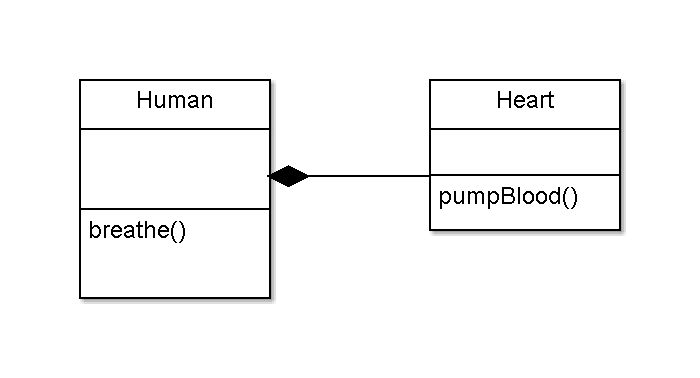 In Strategy pattern, objects representing various strategies are created and a context object behavior changes depending on these strategies at runtime.